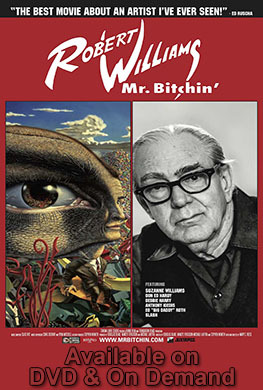 ROBERT WILLIAMS MR BITCHIN', a documentary film, delivers insight into multiple American counter-cultures by following the great American artist and underground legend Robert Williams. From Hot Rods to Punk and Metal, from LSD to the top of the art world, the influential paintings of Robert Williams defied categorization until they became their own art movement. This documentary delivers insight into multiple American counter-cultures by following the great American artist and underground legend Robert Williams. From Hot Rods to Punk and Metal, from LSD to the top of the art world, the influential paintings of Robert Williams defied categorization until they became their own art movement.